FOR A LIMITED TIME, ONLY $47.99 Plus FREE Shipping in the lower 48 States! Thousands of the Timara String Drop have been sold worldwide. 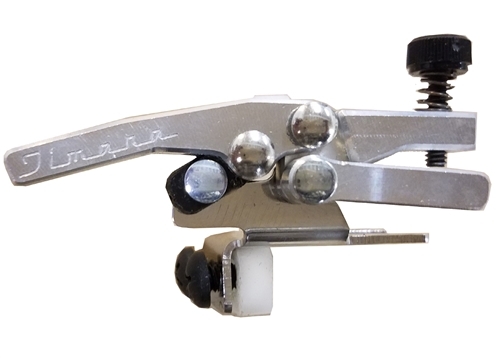 The perfect DROP D TUNER, but also works on other Strings to use for a String Drop or String Raise. Example: Tim’s setup is used to Drop the big E to D and another String Drop on the A String to raise the A to B. It requires NO MODIFICATIONS to your guitar. Works on 6 Inline Tuners such as well as 3X3 Tuners. 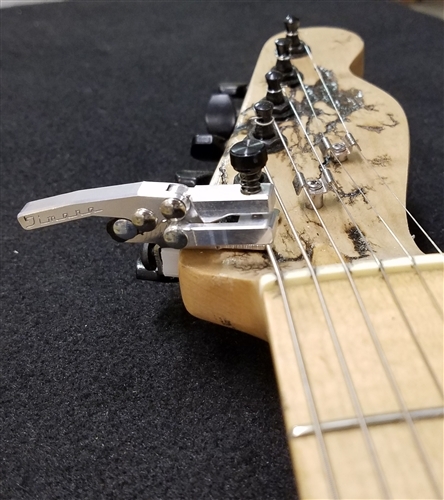 For Nut/Washer tuning keys only. Will not work on bushing style tuning keys. Available in both Right Hand and Left Hand models. To install, simply loosen the Nut on the desired tuning key. Put the String Drop in between the Nut and the Washer and the retighten the Nut. FAST and EASY! Place the TAB with the Fine Tuner Screw as close as possible above the String. If there’s space between the back of the String Drop bracket, use the Nylon Screws to fill any space. The Nylon Screws will not mar your guitar. If the string needs to get more pitch, loosen the string and while winding it back up, make sure the string is winding up instead of the usual winding down. The same works in reverse if you’re getting to much pitch. This will usually get you the pitch you need. (Using the big E String as an example to drop to D) With the String Drop disengaged tune the string to D. Then engage the String Drop and use the Fine Tuner to tune to E.
Always disengage and then engage again several times and retune each time until the guitar string is stretched out. Usually a dozen times is more than enough to get the guitar string stretched out. The Timara String Drop works on just about every Nut/Washer Tuning Key Guitar, but if you’re having trouble getting it to work, call or email us for support. Perfect for Drop D Tuning, D-A-D-G-A-D and other alternate tunings. For a GREAT Effect, slowly DROP or RAISE the string to add cool effects! Fits Electric and Acoustic Guitars, Lap Steel, Dobro and Banjo. Easily fits in case or gig bag! Designed so you can even stack 6 in a row! RIGHT OR LEFT HAND MODEL: Left hand models also work on 3x3's for the little E, B and G strings. Most likely, if you're right handed and using the String Drop for the BIG E String, you'll order a Right Hand model.